Texas House Speaker Joe Straus, R-San Antonio, urged business leaders Tuesday to keep up the fight following the failure of legislative efforts to pass a "bathroom bill" that many of them opposed. "We need the business community to stay engaged, and it begins with public education," Straus added, invoking the House's long-running goal of overhauling the state's broken school finance system. In Austin, Straus had been the highest-ranking official against bathroom legislation, a priority of Lt. Gov. Dan Patrick that would have regulated which restrooms transgender Texans can use. Straus opposed bathroom legislation during the regular session and a subsequent special session that Gov. Greg Abbott called in July to take up the proposal, as well as 19 other unrelated items. Earlier in his speech Tuesday, Straus said the bathroom bill debate showed that sometimes "the most conservative solution is for government not to take action that isn't necessary." Straus’ opposition to the bathroom proposal made him an even bigger target of some conservative activists than he already was. But it also made him a star among the audiences like the one he addressed Tuesday, which gave him an admiring reception as he spoke — particularly about the bathroom bill. "Thank you all," Straus said upon taking the stage to long applause. "I feel like I'm finally having my own quinceañera." Straus also used his remarks to touch on another issue from the special session: the tension between state and local officials that was driven by some of Abbott's agenda. It included proposals to restrict local governments' ability to raise property taxes and regulate trees on private property. "Harvey has shown how important it is for state leaders to work with local officials," Straus said, referring to the hurricane that devastated much of the Gulf Coast last month. "I believe that local control is a core conservative issue. One-size-fits-all solutions don't always work, whether they come from Washington, D.C., or from Austin, Texas." Speaking with reporters after his speech, Straus again discussed the response to Harvey, voicing agreement with Abbott and Patrick that a special session won’t be needed to deal with it. The last special session ended in August with Abbott’s agenda half-complete — and tempers flaring over the House’s resistance to some of the items. 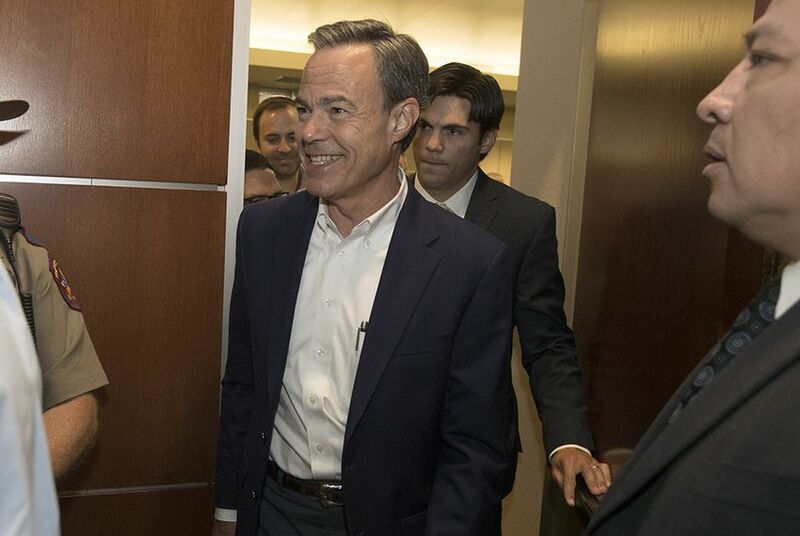 Asked if he can still work with Abbott and Patrick after the contentious special session, Straus said, “there’s always hope that we can do better work” if state leaders focus on issues that affect all Texans. "Some of the words that were said were unfortunate, but look, I’ve been doing this a long time, and there are outside groups that have influence that want me to govern as an extremist, and I haven’t done it, and I won’t do it regardless of what people say,” Straus told reporters. As for whether he will definitely run for speaker again in 2019 — it would be a record-breaking sixth term behind the gavel — Straus said he has not changed his mind. “Yeah,” Straus told reporters. “Filed, and I got a pretty busy schedule coming up."